Gege Crochet: Mario Party! Part 3- My Quest Ends. Ok- now we are now on the home stretch. My previous post has the blanket half way finished....now for the final half! Alright....I knew that I was going to have a battle scene for my blanket. In order to put up a good fight, Mario had to get big, but I couldn't fit all of the characters/scenes I wanted previously with Mario taking up so much space. So, towards the end of the blanket, he finally gets a Big Man mushroom. Hmmm.....where does this pipe lead?? Ok- I ain't even going to lie....this is my hands-down all-time favorite of all the panels. I dreamed about making this panel since the very beginning. It came out just as I imagined! I am so incredibly proud of it! It's HUGE! It's 3 panels wide and 2 tall- roughly about 4' x 3'. It can be a wall hanging- something I've been debating about doing. I wanted to keep this one all by itself b/c it's so awesome. I LOVE LOVE LOVE this one!!!! Here's another comment for you and all your hard work!! I can't believe all the work you put into this!! Thanks for sharing each panel. holy moly its Mario. this is AMAZING. This is absolutely AMAZING!! I'm blown away at the detail and everything you were able to incorporate into your panels... IN CROCHET!! You, m'dear, are a genius. Awesome! I commented about your blanket over at Craftster, but I had to stop by here and tell you congratulations. Your work is superb! It's really quite amazing. Now I need to figure out where to learn Tunisian from so I can try to make something a quarter as cool as this is. I love how the panels tell a little story in order (poor Luigi!). HOLY CRAP. I AM SHITTING BRICKS. This is epic. I cross-stitch video game stuff, so I totally understand your passion... but my crocheting skills are nowhere near insane enough for this. Thank you for sharing with the internet. You're a hero. Your project was linked at ravelry.com. My son and I both think it is awesome! Woohoo. Great job. I love your blanket, it's wonderful! You inspire me to do it for me, I used to play Mario World in my childhood and I love crochet! I saw this on crafster and loved it! I have been going thorugh the blog entires and it is just awesome! the skill level you show is great and the techniue is just wonderful not to mention the awesomeness of Mario! I would love to see a pattern or event charts to try and figure this out for myself. I made my husband a vinyl bag that was an old nintendo controler and people love trying to push the buttons when he takes it on the bus to work. He said he needs me to make more things like that for him. This would be great! This blanket is stunning! I never get past the first level in Super Mario Brothers and you have the whole thing from beginning to end including the secret place in level one. I didn't realize it was so big until I saw the photo with your husband laying on it. And it really looks good on your bed. What a family treasure this will be--everyone will want it. Beautiful. I am working on a graph pattern afghan right now and it's taking forever. My wonderful baby labrador got ahold of it, broke yarn skeins and in general, decided to take it for his own. Since the incident, I haven't worked on it...but I noticed something you said...that you worked right-side only. Would love some info on that! amazing work, but are you sure it was crocheted? i knit, and i can tell by some of those stitches that it was knitted. Onenitestans....I believe I read that this was done in Tunisian crochet, which can resemble knit. I crochet(and knit) like a mad woman and can tell that it's definitely crochet. Wonderful, wonderful job!!! I'm amazed at the work you did on this and it must have taken up a good chunk of time. Designing, the charts, the math that was involved...I am BLOWN away! My kids and my husband are all begging me to make one now lol. Congrats on a job VERY well done. I am impressed. Hey Luvs2Knit! I actually took the pics down and will put them back up after a little editing. :) Check back in the near future and they'll be back! I just love love LOVE this blanket! You have inspired me to learn tunisian crochet, and now I have had some time to practice, will start on a similar project myself - thanks to you! I can send you a link, when I have something to show. I do not mean to nag on you, but I would really love to see the pictures you have deleted from this page! So amazing! Now I really want to try Tunisian. I hope to make a football one for my husband next year for his birthday or Christmas. 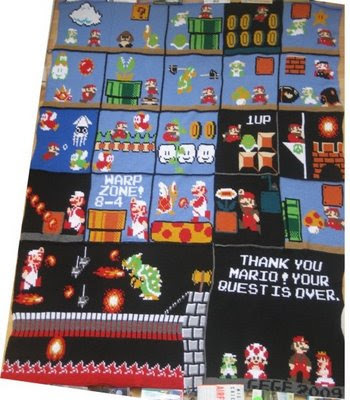 i would really love a copy of your mario blanket i am willing to pay for a copy please email me at bottomsup1214@excite please with your answer. thank you rose. This is absolutely amazing!!!!!!!! I've played this game a million times, it's truly my favorite. Awesome job you genius! This is AMAZING!!!! This is still my favorite game:) Love this and great job genius you! I am so in love with this!! I would love to make it. I'm currently working on a Mario granny square blanket. But I would love to make this!